"This beautiful Cascade is in a rocky chasm lying between Torc Mountain and Mangerton, and is supplied by two streams issuing from the sides of the latter, which unite a little above the Fall. The larger of these streams carries down the surplus waters from the Devil's Punch Bowl, a small ovel-shaped lough, the area of which is about two acres, and its level above the Lower Lake 1,140 feet. The cataract falls over a broken ledge of rocks sixty feet in height, and after heavy falls of rain, or during the winter months, when the volume of water is great, the effect is very striking, though even in the most arid seasons it is beautiful; the white foam beaking over high rocks, casting the spray to inconceivable distances - rushing and brawling along its course, scattering its influences among the long green ferns, and giving such prodigious vigour to the wild vegetation which it nourishes. 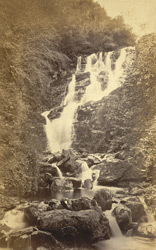 The water descends in a broad sheet, the first fall being of considerable width; the passage is then narrow, and another fall occurs; then follow a succession of falls, all rushing and foaming against the mountain sides; and, indeed, almost from the base of the Great Fall until it reaches Torc Lake, the river goes leaping from one rock to another. From the basin at the bottom of the Fall it hurries impetuously along its rocky bed, and after a rapid course of half a mile, it mingles its waters with those of the Lake. The steep sides of the chasm are richly clothed with fir and pine trees of various kinds, which, in common with all the trees of a similar growth around, were planted by the late Colonel Herbert. From its proximity to the road and to Muckross, this romantically-situated and highly picturesque Cascade is much visited and universally admired."